Deep in the heart of Cherokee Country, in the foothills of the Ozark Mountains, the small town of Tahlequah, Oklahoma is giving rise to a dynamic and eclectic cure for the common country music rut. Led by Dr. John Fell (a general practitioner by day and manically expressive singer-songwriter and acoustic guitarist by night) and artist/musician, electric & acoustic guitarist and mandolin master Kyle Brown, DocFell&Co has been kickin’ the dust up around these parts since the early 2010s, channeling the masters (Woody Guthrie, Hank Williams, Johnny Cash) to create a fusion of traditional country, hillbilly, bluegrass, Americana, red dirt, folk and gospel funk. 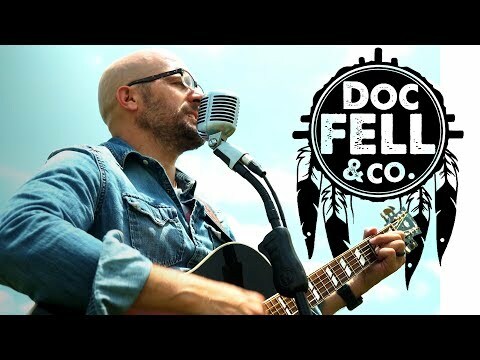 After several years of playing in a cover band, DocFell formed the band in 2011 after he moved to Tahlequah for a new job. Fueled by the emotion from a recent divorce and associated baggage, he began writing songs aggressively, By 2012, he had penned enough tunes to toy with the idea of making an album. Meeting producer Aaron Pack, owner of the infamous audio cauldron known as Monotone Studios, was a turning point. On any given Wednesday, in a back alley smelling from fryer steam and hash browns, DocFell would walk up the janky flight of stairs and create his raw, authentic traditional country magic while neck deep in padded walls built of fiberglass and sound boards. He spent months watching his stories bounce between the corners of this building, evolving from words into melodies and from sound bites into millions of moments that gave rise to his debut album Scissor Tail. Midway through that album, he met Kyle, who would become lead guitarist and co-producer of both recordings. 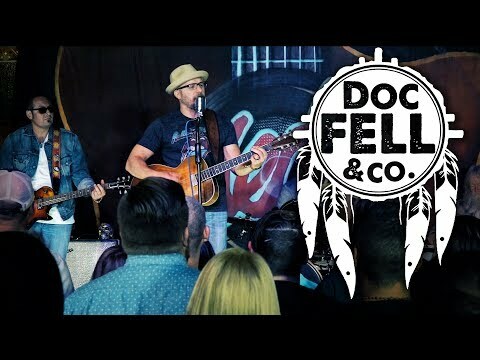 The other core members of the DocFell&Co collective – John Barker (electric bass guitar), Kevin Rose and Joe Sloan (percussion) – joined in 2016 as they finished up Dust Bowl Heart and continue to tour with DocFell and Kyle. DocFells says he was struggling to choose the right songs for the album when he woke up one morning from a dream. He visualized placing ten tracks in a certain order that would tell a tragic love story. The rollicking Lonsomville begins the journey at ground zero with being alone. On the throughtful, mid-tempo “The Less I Know,” he meets someone who could be the cure for his heartache. The spirited call and response on “Love Sick” finds him falling head over heels with someone, while the stark acoustic ballad “Oklahoma Lady” is technically a love song to Oklahoma but could easily be about a woman. “Home on the Hill” is about struggling through the hard times and trying to build a life together. “Moving to the flip side,” DocFell says, “’Dandelions’ is the transition piece. We can&apos;t control the future being at the whims of our fickle fate, and in my mind I was the dandelion and she was the hurricane. ‘Broken Heart’ clearly spells the beginning of the end of the relationship. ‘Tumbling Dice’ continues the theme of fate, as we were just tumbling dice in the hands of time. Finally, ‘Dust Bowl Heart’ pays homage to the Dust Bowl Era and provides great imagery for the universal theme of a love gone bad. I sing ‘My love don&apos;t grow there anymore. It it used to be the richest soil but now it is dirt poor.’” The final track on Dust Bowl Heart, the lively narrative tune “This Machine,” is a tribute to Woody Guthrie. In it, the tragedy has resolved itself and the determined troubadour has taken to the road with his machine and is just trying to make it through the night, while his cup runneth over with tears of sorrow.